With no funds available to refurbish the old palace where the ivory is exhibited, the radical solution was to design an exhibition detached from the building envelope that would ‘visually dissolve the space’. A pier, clad in red leather, interconnects the glass cases, creating a striking colour contrast to the monochromatic objects on display. The lighting scheme is an exercise in precision and integration. Each display case is a luminous cube with partially frosted glazing. 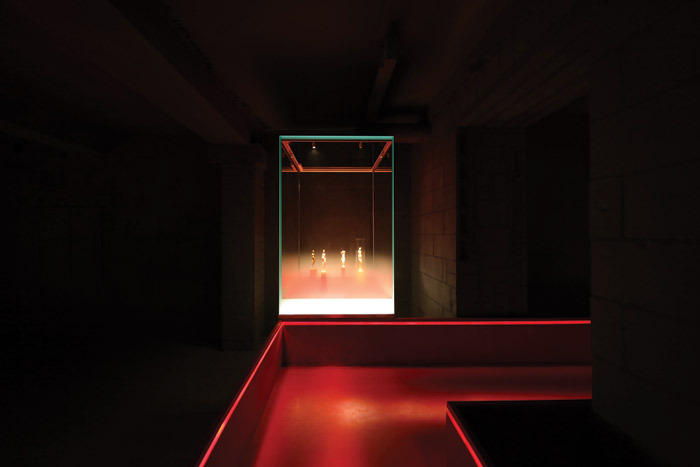 Together with discreet accent lighting, the effect is to make the exhibits appear to emerge from a mist. The brief was to avoid any reflections in the glass from sources both inside and outside of the case. Those outside the showcase remain fully concealed through careful positioning and use of accessories, while all luminaires inside the cases have a focused light distribution and a snoot. The cabinets consist of fully glazed hoods without any corner profiles where lighting devices and wiring might be hidden. To achieve the pure effect demanded by the concept, designers introduced a small profile tracing in the interior upper cabinet corner to accommodate all lighting elements, concealing cables and splices behind a blind cover. On-site testing revealed that silver anodised elements were less visible than black, so fittings and cables were adjusted and invisibly embedded into the glass mitre joints. 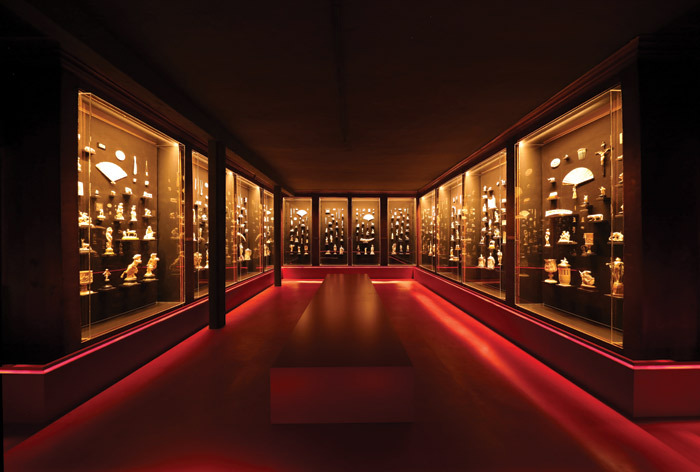 To chime with the red hue of the exhibition design, the main colour temperature of the display lighting is 3000K. An LED edge light is integrated into the base of the cases, where the lower third of the glass is frosted, allowing a gentle transition into clear glass. Because of the edge light, the frosting takes on a gentle brightness. Here the temperature is 5000K, cooler than the object and walkway lighting. This creates the impression of an icy haze from which the exhibits, mainly figurines, emerge. The red-clad walkway is strongly defined to enable safe access, especially for the elderly and disabled. This helps with orientation, giving a sense of balance, ‘and provides a proverbial red thread to guide guests through the exhibit’. A groove was milled into the upper part of the inward-facing pier balustrade flank and houses LED strip-lights fitted with black honeycomb louvres. These shield the light sources even from longitudinal views, while slanted apertures are aimed at a carefully tested angle on to the walkway. 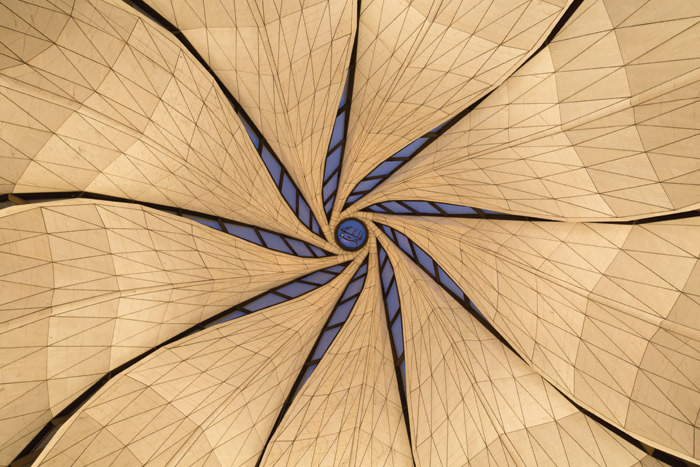 In development for more than eight years, the complex sculptural structure of the temple is composed of nine translucent petals made of marble, glass and steel – a steel structure, an exterior custom glass cladding and interior marble skin. 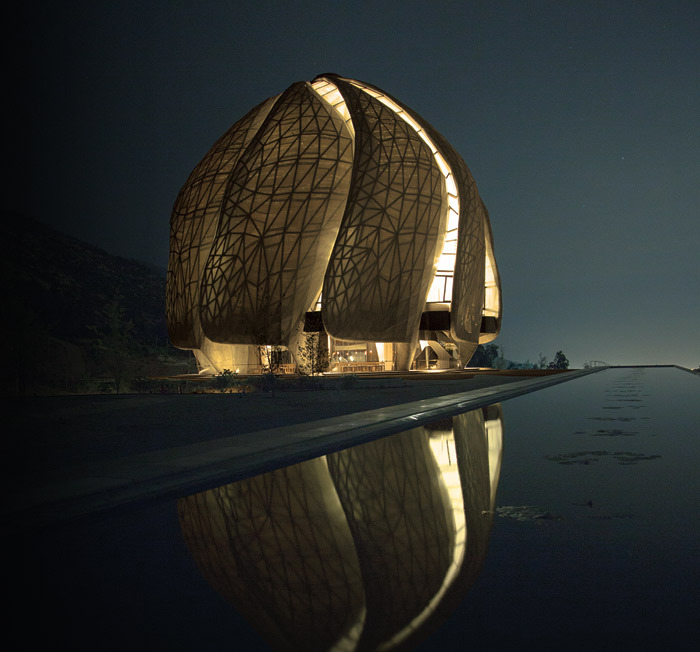 The exterior lighting concept relies on the transparency of the materials so the building becomes a softly glowing lantern. Inside, the aim was to create a warm, monastic and intimate ambiance conducive to meditation and prayer. The scheme again involved close and early collaboration with architects at HPA so that light fittings could be integrated into the build as invisibly as possible. The low-illuminance, indirect solution for the interior is created by using the backs of the mezzanine benches. The 2700K elliptical distribution spotlights create a warm light, while also producing a grazing effect on the marble petals, highlighting their complex shape. The luminaires integrated into the structure create the exterior lighting effect, positioned on the vertical bronze profile connecting the windows to marble petals. Illuminating the top part of the nine petals, these fittings feature a custom-designed bronze housing and are seamlessly integrated into the form. The only visible luminaires are decorative and specially designed. The first is a pendant hung from the marble petals, which illuminates the stairs and reading place below. The second fixture is a floor lamp resembling a candle. This is used between benches on the first floor to complement the indirect lighting and restore a human scale in the soaring 30m-high space. Lighting, both artificial and natural, is central to the design of the New Shanghai Theatre. It sculpts the interior and provides a foil to its solid concrete elements. ‘Light plays a starring role throughout. 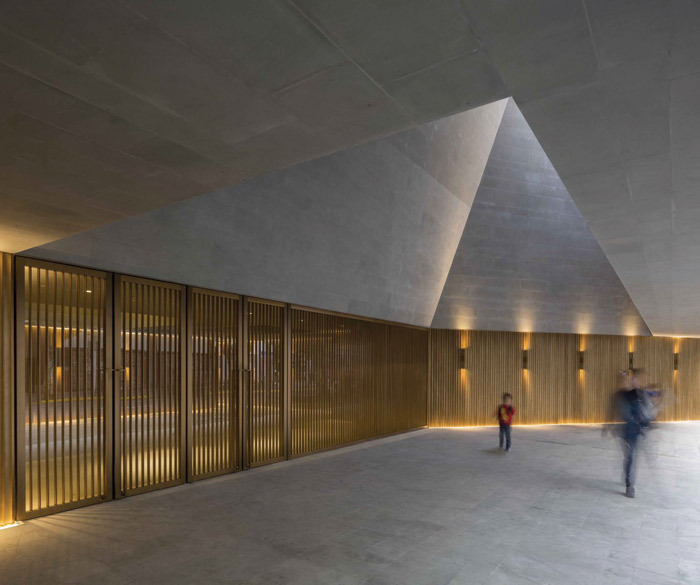 Heavy stone masses are counterbalanced by vaulting, luminescent voids revealing movement in the sky and within the building’s envelope,’ says winner Uno Lai. Close collaboration with architect Neri&Hu was needed from concept to execution to achieve this sense of light as an architectural element. For the visitor, there is a sense of journey. Warm fluted bronze walls, accentuated by custom sconces, draw visitors across the threshold. Subtle coves allow these walls to ‘float’, evoking the rich folds of theatre curtains. Visitors’ eyes immediately lift to a vaulting skylight. ‘Strategically augmented skylights deepen the dramatic dialogue between illumination and shadow,’ says Lai. Exhaustive sun studies were carried out to allow for an ‘invisible’ enhancement of daylight – using electric lighting – through the seven roof apertures. ‘The site came with strict limitations on horizontal daylight access, so the skylights were crucial in creating a dramatic inside/ outside dialogue,’ says Lai. ‘The lighting design challenge was to employ the deep wells of the skylights to their maximum effect while minimising all excess energy use and reducing the building’s contribution to light bleed in a city notorious for over-illumination.’ By studying the sun’s path across the building, a series of mock-ups and models informed the precise placement, specification and angling of LED fixtures within the skylights.